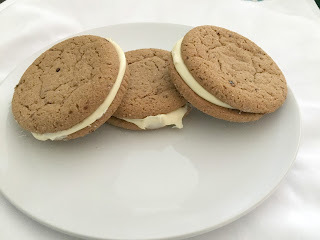 #FilltheCookieJar is a blogging event hosted by Cynthia of Feeding Big where bloggers create cookie or bar recipes based off a theme. The theme for August was Grandma’s Cookies. 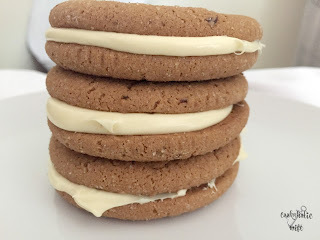 I figured I would decide on an old-fashioned cookie recipe and go from there. I decided on molasses cookies and happened to be talking about it with my co-workers when one of the mentioned that I should make them into sandwich cookies and fill them with my whiskey buttercream. 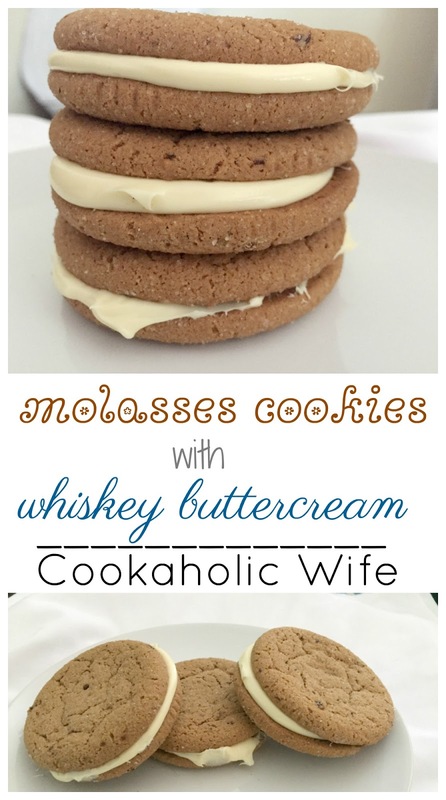 I pondered over that for a moment, could I really picture a grandma making cookies in her kitchen and adding some whiskey to the buttercream? And well yes, I could. I’m sure even grandma could use a drink now and then. I pictured this older woman bustling around her kitchen, the counter filled with flour and sugar, a smudge of flour on her nightgown and she looks over at the clock and sees the grand kids are coming in less than an hour. She pauses, mind whirring and then swiftly makes her way into the dining room, grabs a bottle of whiskey from the cupboard and adds a splash to the buttercream. Then takes a swig herself and returns it back to its place. Sure brings a new image of “cooking baking grandma” to mind, doesn’t it? Anyway, let’s get onto the recipe, shall we? Sweet molasses cookies are turn into cookie sandwiches with the addition of a whiskey buttercream. 1. In the bowl of your stand mixer, add the butter and sugar and beat on medium speed until light and fluffy. Add the molasses and egg and mix until combined. 2. Meanwhile, combine the flour, baking soda, cinnamon, nutmeg, ginger and salt in a bowl. 3. Add the dry ingredients to the wet ingredients, mixing until fully combined. Turn out the dough onto a piece of wax paper, wrap up and refrigerate for 30 minutes. 5. Remove from the fridge, roll into a log and refrigerate again until fully chilled, at least a few hours. 6. Preheat the oven to 375 degrees and line large baking sheets with parchment paper. 7. Slice the dough log into ½ inch rounds, then cut into quarters and place 2 inches apart on the prepared baking sheets. 8. Bake for 8-10 minutes or until set. Remove from the oven and cool on cooling racks. 9. Match up like size cookies. Spread buttercream onto the bottom of one cookie and top with the other, creating a sandwich. 1. In the bowl of your stand mixer, add the butter and beat until light and fluffy, about 5 minutes. 2. Slowly add in the powdered sugar, about ½ cup at a time until fully combined. Add in the salt and vanilla. Taste to see if the additional ½ cup of powdered sugar needs to be added. 3. With the mixer running, add in the whiskey and then drizzle in the heavy cream until the frosting loosens up enough to be spread or piped. Now that’s a cookie! 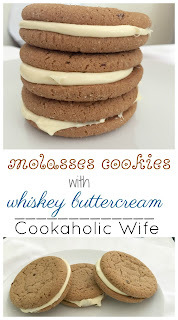 Molasses and whiskey totally go perfectly together. I made a half batch of these and froze the rest of the dough. I took them into work and they were gone in minutes. My coworker who suggested the idea said they were amazing and that he couldn’t believe I used his suggestion. Hey, I know a good suggestion for recipes when I hear one! You are right, grandmas are just people too (I can say that because I am one 😉 ) These cookies sound great with your filling! Thanks for the smile Nichole. My Grandma probably would have grabbed brandy but she absolutely would have no qualms adding it to her food and enjoying a nip herself.